Ibrahim’s car smells of vinegar and he notices me wince on entry. ‘People very sick sometimes,’ he booms. ‘I clean up – a lot!’ His ivory teeth are the only thing visible from the acrid gloom at the back of the mini-cab. It’s not long before me and the auld one realise why people are sick. The car lurches through impossibly choked lanes of traffic as if pulled by an invisible force, weaving, screeching and, incredibly, for a 1987 Vauxhall cavalier, actually zipping in little diesel fuelled bursts of acceleration into gaps which aren’t gaps. Our journey up to Kilburn is accompanied by a soundtrack of beeps and toots from pissed-off drivers punctuated by the odd ‘Wanker!’ from cyclists: but they deserve it; cycling in London is a death wish. A death wish only matched by my decision to get into Ibrahim’s car after the Oak’s landlord decided he wouldn’t be serving any more drinks to weird keening men. I’d decided to get him a drink given his singing had saved me a trip to A&E. It was the least I could do. ‘Hey, Ibrahim,’ I ventured, in between lurches, ‘What’s the story with getting a nightcap?’ Lurch. ‘Where we going then?’ My head rebounds off the side window. ‘A place,’ Ibrahim booms. ‘Always open’. I attempt to settle back in the vinegar seats and reassure my elderly guest, but, incredibly, he’s actually relaxed, simply enjoying the ride. ‘It’s better if you don’t fight it,’ he says, before watching a bike courier, all Trustifarian ‘locks and tie-dye surf gear, career into a parked van. ‘I barely touched him,’ Ibrahim reassures me. I add another lump to the side of my head. The seats are surprisingly springy so I settle back and let the bumps form part of the rhythym of the ride. 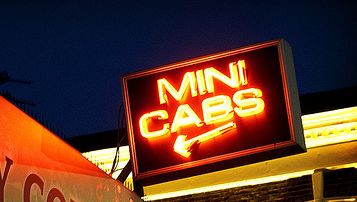 Ibrahim’s actually gone to the trouble of attempting to legitimise his illegal mini-cab. I can see a couple of badly self-laminated identity cards swinging from the mirror. I notice they are actually the same picture but twith the different names. Alongside, Ibrahim Al-Masry’s gurning mug was an identical passport pic slithered into something official – but clearly fake – but this time his moniker was Ayo Ajose, Nigerian. ‘Unlike your driving, then,’ I suggest sarcastically. I get a third, larger, bump.